The first to discover that teachers make perfect scapegoats was George W. Bush. When he ran for president for the first time twelve years ago, Bush had a problem. He wanted lower taxes to be his rallying cry, but while taxes in Texas, the state where he was governor, were indeed low, the schools in Texas were notoriously bad. The numbers are no better today: Texas ranks 47th in the county in literacy, 49th in verbal SAT scores and 46th in math scores. To blind the public to the evidence of what low taxes do, Bush produced evidence of a miracle: When it comes to education money is not what matters, he declared; what matters is holding teachers accountable. In Houston, Bush told voters, the superintendent of schools held teachers accountable, and as a result Houston saw a dramatic improvement in school quality, particularly when measured by high school graduation rates. So convincing was the miracle that as soon as he took office Congress agreed to pass the Bush tax cuts and the No Child Left Behind law. Eight years later the “Texas miracle” was exposed. It turned out that the numbers had been cooked: Instead of the 1.5% drop-out rate that Houston had reported, the actual rate was somewhere between 25 and 50 percent. And in order to boost test results children who were considered weak in even just one subject were prevented from entering the 10th grade, the year in which the tests were administered. But by then the truth no longer mattered because the ideas that taxes are not needed to run a democratic government and that teachers, not budgets, are responsible for the failure of schools had invaded the body politic. When Bush ran for office the rate of unemployment was low and there was a surplus in the government coffers, rather than a deficit. Today the economic situation is dire and most Americans believe that inequality is the biggest problem that the country faces. Occupy Wall Street blames the 1% — but the 1% and their elected officials have found someone else to blame: Bad teachers are back. A new study just out from economists at Harvard and Columbia would seem to offer the proof. The study does not claim that the measurement of teachers will produce better students–this was Bush’s claim and it has already been exposed–but instead that the measurement of teachers will make students richer as adults. Unlike the Texas miracle, the Harvard-Columbia revelations are not based on fraudulent numbers. But what is deeply problematic is the spin that the authors give to their findings. The study examined the incomes of adults who, as children in the 4th through the 8th grades, had teachers of different “Value Added” scores, with Value Added defined as improvement in the scores of students on standardized tests. The study claims that the individuals who had excellent teachers as children have higher incomes as adults; we will examine the validity of this claim below. But first we must ask what these higher incomes mean. When they were children, these individuals were poor. What the H-C authors fail to mention is that even when they had excellent teachers as children and therefore have higher incomes as adults, these individuals, despite their higher incomes, remain poor. The devil is in the details: the average wage and salary of a 28 year old in the H-C study who had an excellent teacher was $20,509 in 2010 dollars, $182 higher than the average annual pay of all 28 year olds in the study. How does this compare to the average salary and wage of a 28 year old in this country? The authors excluded from their study people whose income was higher than $100,000. As we shall see, this exclusion is problematic; but to do the comparison we must do the same. The average salary and wage in 2010 of a 28 year old who earned less than $100,000 a year was $29,041, 42% higher than the income of a 28 year old in the H-C who had an excellent teacher. In other words, even if we accept the numbers that the authors of the H-C study choose to spin, having an excellent teacher cannot pull people out of poverty. The exclusion of people with high incomes involved some 4,000 individuals, or 1.2% of the sample. The authors justify it by claiming that such people are outliers. But what if it turned out those high income earners had “bad” teachers? Including them in the study would have completely changed the results. Excluding a large number of the best performers from a study about the effect of teaching seems strange. There’s more. While the H-C study found a statistically significant, if meaningless, relationship between the “value added” of teachers and incomes at age 28, the authors did not find a statistically significant result at age 30. Why? In the study the authors explain this by the small number of 30 year olds in their sample. In their interviews with the media and in public presentations the authors do not mention this result at all. Yet the number of 30 year olds in their sample is 61,639, and these are all students who went to school in the same city. Is this a small sample? To gain an appreciation for the size of the sample consider the fact that in order to estimate the unemployment rate that it publishes every month, the Bureau of Labor Statistics relies on a national survey of 60,000 households with an average of 1.95 adults in each. Surely if 120,000 peoples are a good size sample to study a labor force of 150 million people spread all over the country, a sample of 61,639 is a good size sample to study a population of fewer than 5 million elementary school students who all come from the same school system. By any measure the sample size is not only adequate, it is fantastically huge, and the result is not statistically significant. But the statistically insignificant results for 30 year olds may have been inconvenient for the authors for another reason. An increase of $128 a year is small by any standard, so the authors resorted to estimating a lifetime increase in earnings due to this increase. To do that they assumed that the percentage increase in income, 0.9 of one percent, which they estimated for age 28, holds for each year of a person’s working life. And perhaps this is why the authors chose to ignore the results for the 30 year olds. All that their findings permit them to claim truthfully is that an excellent teacher increases average annual income by $128 at age 28, and that this effect disappears at age 30. But then there would have been nothing to report. The attack on “bad teachers” is a dishonest diversion, and nothing more than a reincarnation of the Texas Miracle. The problem is the power of the 1%; the solution is to pass it to the 99%. Moshe Adler teaches economics at Columbia University and at the Harry Van Arsdale Center for Labor Studies at Empire State College. He is the author of Economics for the Rest of Us: Debunking the Science That Makes Life Dismal (The New Press, 2010), which is available in paperback and as an e-book. The Argentine Confederation of Transport Workers warns of boycotting British ships reaching Argentina as the UK refuses Argentina’s call for negotiations over the sovereignty of Malvinas (Falklands). “We have resolved to boycott any ship with the British flag, or with the lying and invented flag of the Falklands, or with any flag of convenience which the British pirates use,” the union said in a statement. Earlier, in response to Britain “militarizing” the South Atlantic by sending a nuclear-armed destroyer to the area and the dispatch of an heir to throne, the Duke of Cambridge, to the region, Argentina raised the possibility of shutting the only air route to the islands which passes through Argentina’s airspace. Seeking to resolve the issue through diplomacy and urging the UK to stop waging war over the islands’ sovereignty, Argentinean Foreign Minister Hector Timerman submitted an official complaint to the United Nations Security Council against Britain’s repeated military threats. However, Britain’s ambassador to the United Nations Mark Lyall Grant warned Argentina that the UK would “robustly” defend Malvinas Islands if necessary, claiming the British government would hold talks with Buenos Aires on any issue except the islands’ sovereignty. In December the South American trading bloc Mercosur including Argentina, Brazil, and Uruguay, decided to deny entry to vessels carrying the Falklands’ flag from their ports. Later, the Chilean government also expressed its solidarity with Mercosur members. India is uneasy at Israeli accusations about Iran’s hand in the Monday bombing that targeted an Israeli embassy car, badly injuring the wife of the Israeli defence attache. India, the sources said, does not want to be drawn into a diplomatic war of words between Tehran and Tel Aviv. Iran has rubbished Israeli charges as “empty lies”. But with Israel launching a diplomatic offensive and the American Jewish Congress (AJC) asking India to scale down its engagement with Iran, New Delhi could come under renewed pressure from the West to cut off ties with what the Americans say is a rogue regime. India has launched a probe into the terror attack. “The probe is on,” is all Indian officials would say. Ajai Sahni, a terrorism expert, said it was very unlikely that the attack would ever be traced to the Iranian state. But he agreed that India could be under extra pressure as Israel may leverage the incident to portray Iran as a rogue regime. No deaths, just long sought after provocations; a geopolitical gambit executed with the proficiency of Mossad. -US foreign policy makers in the Fortune 500 funded Brookings Institution’s 2009 “Which Path to Persia?” report, pages 84-85. Quite clearly, there is a premeditated conspiracy working ceaselessly to provoke Iran into a war it neither wants nor will benefit from in any conceivable way, and upon failing to provoke Iran, provocations will be manufactured in their stead, as seen in the recently botched “plot to assassinate a Saudi ambassador on US soil,” later revealed to be a US sting operation involving DEA agents and a duped, entrapped patsy. Now Israel is blaming two attacks on their own embassies, one in New Delhi, India and another failed attack in Tbilisi, Georgia, squarely on Iran. There were only minor injuries reported in the New Delhi attack which was carried out in a similar manner to those targeting Iranian scientists in Iran – attacks now admittedly the work of Israeli Mossad agents and US-funded, armed, trained, and harbored Mujahedeen e-Khalq (MEK) terrorists. Iran clearly has nothing to gain by bombing Israeli targets abroad, especially in nations like India where such an act would not only give the West the provocation it is on record trying to “goad” out of Tehran for years, but also one that would unsettle relations with India which would directly effect the conflict in Afghanistan festering on Iran’s eastern border. Conversely, a non-lethal attack on Israeli targets gives the Wall Street-London-Tel Aviv corporate-financier elite the exact provocation they have been fishing for on record since at least 2009. Reuters reports, “a bomb wrecked a car carrying the wife of the Israeli Defence attache as she was going to pick up her children from school.” All the emotional plot points exist to manipulate public opinion against Iran, and behind a Western attack that has so far been perpetually stalled by a world increasingly irate over the West’s global warmongering. The degree to which this likely stunt will be successful in serving as a pretext for war (or at least further escalation) for an axis that has been waging a campaign of terror against Iran for years remains to be seen. This Wall Street-London-Tel Aviv axis has openly admitted they seek to provoke war with an unwilling adversary, and all three are experts at manufacturing provocations for otherwise unjustifiable acts of aggression. Iran is an aggressive though not reckless nation – so says the US policy think-tank Brookings Institution in their own “Which Path to Persia?” report. Iran does not lack an accurate understanding of global public opinion, evident in their English news service, PressTV. Should Iran choose to finally strike out against the West for their blatant and consistent acts of war, they would most likely do so with global public opinion in mind – likely excluding the possibility of targeting a mother on her way to pick up her children from school. As in any crime, big or small, the first and most pressing question to answer is, “cui bono” or, “to whose benefit?” An axis of Western powers desperately seeking a pretext for a war they’ve tried to start for years? Or a nation desperately trying to avoid war, weathering constant and overt acts of aggression directed at their economy, infrastructure, civilians, military leaders, and politicians, only to end up bombing an Israeli mother on her way to pick up her children from school? With this in mind, and with Iran squarely denying any responsibility for the attacks, the burden of proof lies entirely on Israel. HEBRON – Israeli forces demolished 22 buildings in a Palestinian village south of Hebron on Monday, displacing 120 villagers, residents told Ma’an. Twenty Israeli military vehicles accompanied bulldozers to raze the 16 domestic tents and six animal shelters in Khirbet al-Rahwa, they said. Villager Salim Salem al-Tal told Ma’an forces also demolished a well that was the village’s only water source. Soldiers did not give the villagers any time to remove their possessions from their homes, he said. 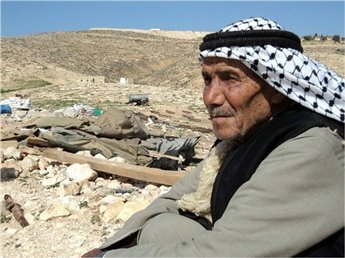 Rateb al-Jabareen, whose home was demolished, said that the soldiers told them they would have to leave the village. Israel hopes to expand the neighboring Jewish-only settlement Tene Omerem by pushing them from their village, he added. He vowed the villagers would remain despite repeated demolitions. Hebron governor Kamel Hemaid said Israeli authorities were systematically destroying Palestinian homes in order to expand Israeli settlements throughout the West Bank. He appealed for international intervention to halt the demolitions. The number of Palestinians displaced by demolitions doubled in 2011 compared to 2010, according to UN figures.